You may wish to ask yourself some important, penetrating questions when embarking upon your own Hero’s Quest: By What Truth Do I Live? Who’s Life am I Living? Who am I Being? To create your own life, to reconnect with the divine, you must break free of the constraints of your ego life by overcoming your fear and aligning your ego with your soul. 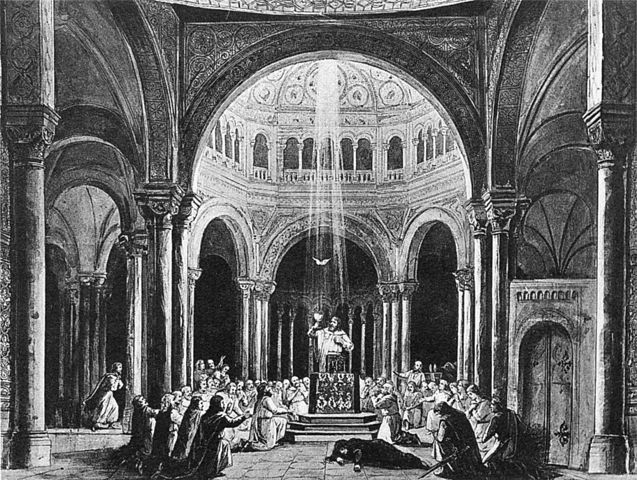 An image of the End of Act III of the opera Parsifal, by Wagner, wherein the Fisher King is healed and Parsifal becomes the Keeper of his Soul – as must must also do. The skills, knowledge and power you acquire in the first part of your life must be brought to serve your soul, not your ego. In service of the ego, power can be abusive, tyrannical, and will destroy you. What is required is what the great philosopher, Arthur Schopenhauer, called the highest form of human morality, compassion. Dr. Viktor Frankl, neurologist, psychiatrist and Holocaust survivor, found that even in the most horrific conditions of Nazi labor camps, one could find meaning in life, that the human spirit is indomitable. We must accept that suffering is a part of our quest, and that it is required for us to grow and free our souls. “Suffering” has roots in the term “sacred,” and is an inevitable part of our Road of Trials . . . and with Compassion, we can share in and empathize with the suffering, the sacred experience, of everyone and everything. Look deeper, let go of arrogance. What is Your Mission? What is Your Bliss? What is Your Calling? Like Parsifal, Siegfried, even Luke Skywalker, we must let go of hubris, arrogance, foolish pride. Your Soul, Your Joy, Your Adventure Awaits!